I have one more finish to share with you before I wrap up the year in quilts. It’s appropriate that this is my last big finished quilt because I worked on it all year. I’m calling it Mend, because not only are the blocks inspired by visible mending (check out the hashtags on Instagram, they’re gorgeous), but because I used these blocks as therapy. Whenever I needed to make something, I made a block. I used a Seminole-inspired style of improv strip piecing, using no rulers (and surprisingly, becoming pretty good at free-hand rotary cutting). I made one here and a few there, laying out the whole top at Mid-Atlantic Mod. It was around this time that I realized that I was using these to cope with some generalized anxiety that I was feeling, and after Mod, I started taking concrete steps to get treatment and professional help for it. I started to see that this quilt was becoming a representation of my self-mending process. I realized that part of my personal self-care involves being realistic about my limitations and asking other people for help when I need it. So in one of the best decisions I could have made for this project, I enlisted the help of the wonderful and talented Krishma Patel to quilt it. I gave her a plan– no curves, as much crosshatch as you like– and she improvised in the negative space, of which there is a lot. She turned negative space into focal points, and really brought the whole quilt to life. 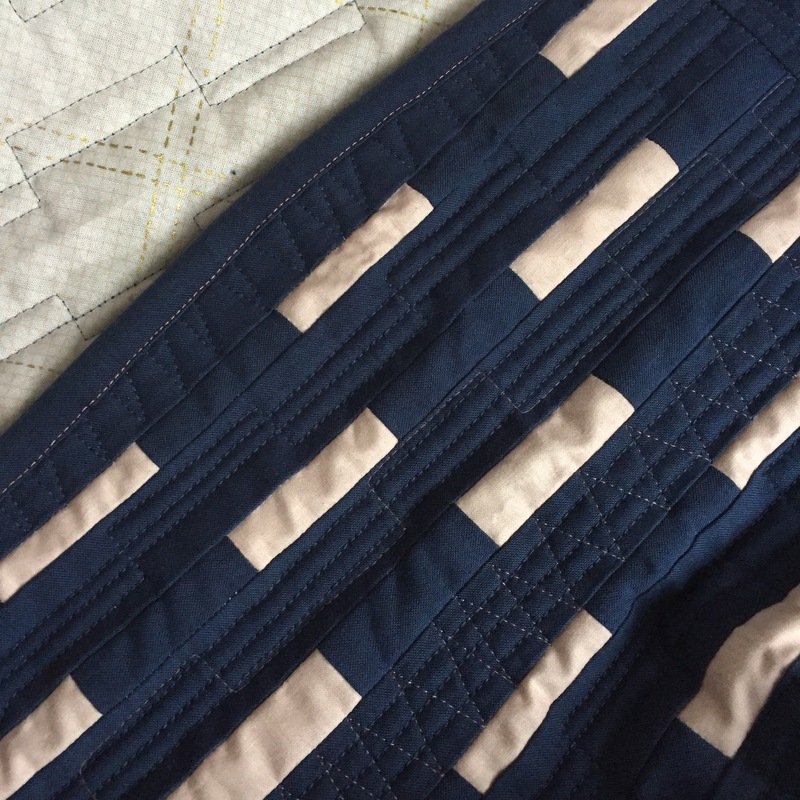 The irony of the quilt doesn’t escape me, in fact I love it– it’s a quilt inspired by hand stitching made entirely by machine. It’s a quilt about introspection made with a largely open and communal process, at retreats and on social media. And it’s a very imperfect quilt that will hang in a show. I’m proud to say that Mend has been accepted to QuiltCon 2017 in Savannah, and I am so glad that people will be able to see it (especially because it’s so hard to photograph) and hear its story. I LOVE the quilt, Mel, and I just love the story, and your honesty. I find we all have the tendency to become overwhelmed with what we plan to accomplish….quilters especially. But some of us handle these anxieties better than others; some people find coping mechanisms that are positives, and others are negatives. Glad you decided to seek help. Warm wishes for a happy holiday with the family, and wishes for a grand 2017!!! Love the intent you had in making this quilt and that it helped to bring you to a better place in life. It’s really amazing! Love it! Mel, As I read your story of the making of Mend, I am chocking back tears! Unbeknownst to you yet, Mend has helped me take off the edge of the depression & anxiety I fell into post elections. I had loaded it and started to quilt it the day before the election. I proceeded to quilt it block by block over a period of 6 days. Each time I spent time with it I began to regain my mental normalcy. I was so sad to finish quilting it. I delayed informing you of it’s completion until you actually had to email me and ask! Mend helped mend both of us, right? it’s beautiful and so are you. i appreciate your honesty and look forward to seeing your quilt (and you?) in Savannah! xo.